The Netherlands is a densely-populated country with 17 million inhabitants. The average population is close to 500 per km2 and more than 7 million people are concentrated in the Randstad conurbation area, which is one of the densest metropolitan areas in Europe. Population density coupled with one of the most dynamic economies of the continent – ranking 6th in the EU – makes transportation key in proving accessibility but also in ensuring high standards of living, economic vitality and vibrant urban life. Having a long tradition of innovation in the transport field which dates to the seventeenth century, the Netherlands has one of the World’s most efficient transport systems. 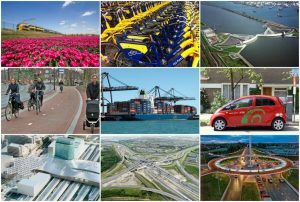 In its Global Competitiveness Report for 2014-2015, the World Economic Forum ranked the Dutch transport infrastructure fourth in the World and number one in Europe. The Dutch have a well develop road and railway network that connects most major towns and cities, as well as a comprehensive dedicated cycling infrastructure, featuring over 39,000 km of bicycle tracks. The Port of Rotterdam is the world’s largest seaport outside East Asia and by far the largest port of Europe. Moreover, the country is connected to central Europe through an important system of waterways. Not only infrastructure but also governance and the ability to work cohesively as a society strengthen the decision-making capacity of the Netherlands. This makes the water country one of the transport hub of the continent and an interesting case study for governments around Europe and the rest of the World. 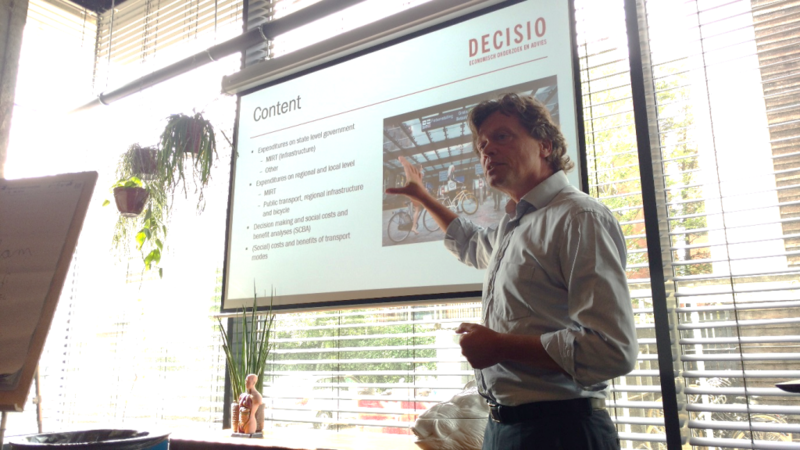 DECISIO was approached by 5 Italian parliamentarians of the Transport Commission to organise a study visit and a series of workshop with key Dutch experts and policy-makers in order to gain a comprehensive and sound understanding of the Netherlands’ approach to transport policy, planning and governance. The visit revolved around four main themes: the national transport policy, low-carbon mobility and cycling, strategic transport infrastructure and, urban and regional transport policy & planning. This intense four-day long study visit saw the participation of representatives of the Dutch Ministry of Infrastructure and the Environment, CROW, University of Amsterdam, Netherlands Environmental Assessment Agency, City of Amsterdam, Transport Authority of Amsterdam, MRA-Electric, Schiphol Cargo Group, VeloMondial, and, of course, DECISIO. Bicycle study tour were organised in Amsterdam and Utrecht to appreciate bicycle infrastructure planning, design choices and innovations in the field directly. Finally, a meeting with Italian professionals living in the Netherlands was organised to have an “italian” external perspective on the advantages and disadvantages of the Netherlands transport system compared to the Italian one as experienced by the user. Recommendations to the 5 parliamentarians were provided at the end of the study visit and support has been offered to help translating some Dutch innovations into the Italian context. Are you intersted to know more about this project or would you like to organise a workshop in the Netherlands too? You can get in touch with one of our advisors. Paolo Ruffino at p.ruffino@decisio.nl or Kees van Ommeren at c.vanommeren@decisio.nl.